The Garden State Parkway (GSP) is one of the most significant roads in New Jersey. Stretching 173 miles from Cape May to the New York State line, the GSP brought new life to the Jersey Shore and revolutionized highway design by incorporate the latest traffic control and safety features in a scenic, landscaped setting. The original section was constructed in less than 4 years between July 1952 and May 1956 at a cost of 330 million dollars and then extended to meet the new York State Thruway in 1957. Construction costs were paid for by bonds sponsored by the state, while operation and maintenance were funded by tolls. 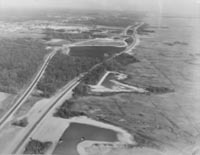 This website tells the story of the early years of the GSP from initial construction in 1946 through the early 1960s. For other information, such as road conditions, service area locations, and directions, please visit the New Jersey Turnpike Authority. A meeting of the NJHA Board of Commissioners, 1958. 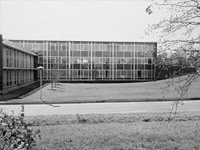 The new NJHA Administration Building in Woodbridge, c.1964. The GSP was constructed and managed by the New Jersey Highway Authority, an agency created in 1952 to oversee large-scale transportation projects across the state. 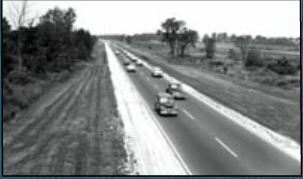 Governor Alfred E. Driscoll signed the New Jersey Highway Authority Act into law on April 14, 1952 to finance and oversee construction of the GSP and other highway projects throughout the state. The legislation passed by both the State Assembly and Senate gave the Authority to “acquire, construct, maintain, repair, and operate ‘highway projects.’” The Act specifically authorized the construction of the GSP, but also envisioned the Authority overseeing other large-scale transportation projects throughout the state; the 173-mile GSP was the only project undertaken and managed by the Authority. 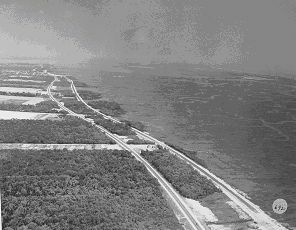 Other long distance roads were constructed and managed by individual authorities, such as the South Jersey Transportation Authority, created in 1964 to construct the Atlantic City Expressway. In 2003, the New Jersey Turnpike Authority and the New Jersey Highway Authority were merged and the Turnpike Authority assumed responsibility for the maintenance and operation of the GSP. Detail of a high wood-and-steel guiderail, milepost and date unknown. Detail of a low wood-and-steel guiderail, milepost and date unknown. High wood and steel guiderail under construction, milepost and date unknown. Original guiderails and barriers were designed to adhere to a rustic aesthetic, and consisted of wooden beams attached to reinforced concrete posts. Modern safety standards have resulted in the replacement of most of these wooden guiderails with Core-Ten™ guiderails or concrete Jersey barriers. 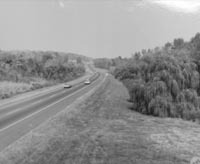 The north and south bound lanes frequently diverged to avoid natural features and create visual interest as in this stretch near Cape May, 1956. View showing the curvilinear design of the Parkway with its landscaped median to shield drivers from the distractions of oncoming traffic. Milepost and date unknown. Parkway curves were often elevated, as seen in this photo of Exit 105 near Asbury Park, 1960. Detail of Griffin's "singing shoulder," milepost and date unknown. Narrow bands of textured concrete designed to vibrate and “sing” when a motorist ventured outside the travel lane lined the GSP. Former NJHA Chief Engineer Harold Griffin is credited with inventing this feature known as the “singing shoulder.” These concrete bands were also known as rumble strips. 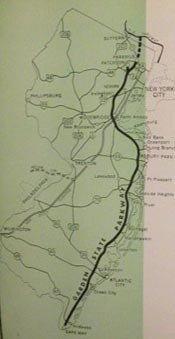 The 9-mile section of road that connected the GSP with the New York Thruway was completed in 1957. It was the last new section of the GSP constructed. Overview showing the interrelationship between the GSP and various road crossings in the Metropolitan Section. Date unknown. Overview showing the complex network of interchanges and road crossings along the GSP in the Metropolitan Section. Date unknown. Although the GSP was planned and designed as one continuous alignment, it was developed for two very different types of motorists in two distinct communities. The section north of Asbury Park was regarded as the Metropolitan Section, designed to carry shoppers and commuters on short trips through and around the state’s most populated communities. Here the GSP resembled a modern superhighway more than a scenic country road as it passed through Newark, Union, and Woodbridge. In some places it divided communities in half, as entrance and exit ramps connected with local roads. The majority of the State Highway Department-funded sections were in this area and have remained toll free since their original construction. Cape May terminus and intersection with U.S. Route 9, 1955. 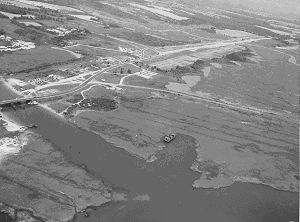 The GSP separated the pine forests from the coastal marshes, as in Marmora, near Cape May, 1955..
More than 2,000 buildings were demolished to build the GSP, including these small tourist cabins along U.S. Route 9 in Cape May County. The southern sections carved their way through the pine forests, crossed wide, slow moving rivers, and bypassed small crossroads communities on the way to Cape May. The Shore section was intended to carry motorists long distances to and from the beach towns, recreational areas, and state forests that dominated southern New Jersey. Where possible, the travel lanes were separated by wide tree covered medians and took advantage of scenic views and existing vegetation. The GSP was also hailed as a necessary and effective firebreak in the pine forests. The NJHA published regular updates of their progress between 1952 and 1957, like this one from their 1953 Annual Report. Gov. 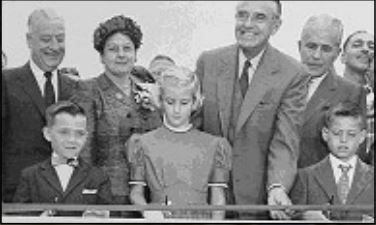 Robert Meyner, Commissioner Katharine White and a group of special guests cut the ribbon on the new York Thruway Connector in 1957. Executive Director D. Louis Tonti and the Commissioners join a group of school children during construction near Newark. Building a road as long and complex as the Garden State Parkway was nothing short of a Herculean task. 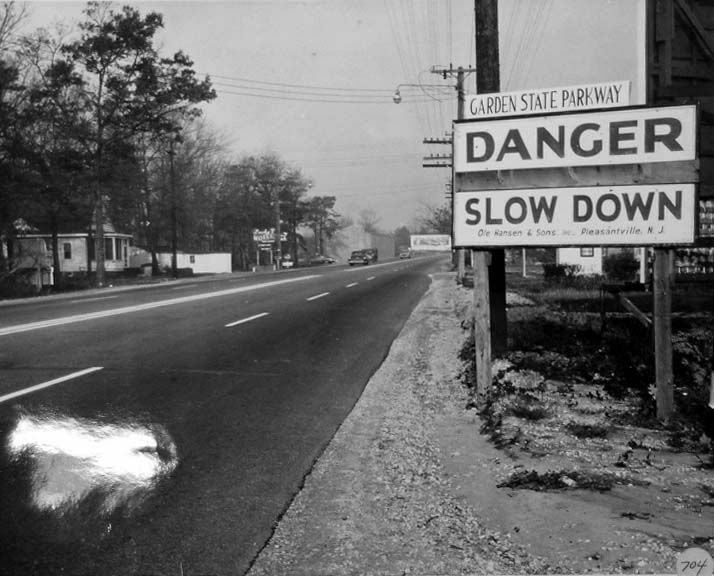 Construction efforts began in 1946 when the State Highway Department began work on a 4-mile stretch in Bergen County. This section of the Route 4 Parkway, as the road was initially called, took nearly 4 years to complete, and was funded entirely through appropriations from the New Jersey Legislature. 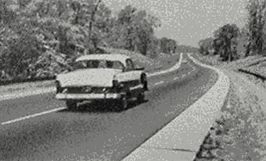 The Highway Department built two more sections, totaling 16 miles, around Paramus and Toms River between 1946 and 1953. Frustrated by the slow pace and rising costs, Governor Alfred Driscoll convinced the New Jersey Legislature to create a special authority to oversee construction of the rest of the road and urged the voters to approve a bond referendum that would provide for all of the necessary financing in one lump sum. The New Jersey Highway Authority was created in April 1952 and in November of that same year, voters approved a $285 million bond referendum to pay for construction. 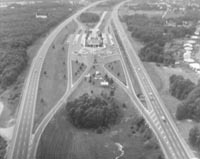 Construction began almost immediately and the entire 173-mile GSP was completed less than 5 years later. 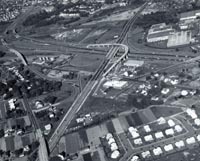 The New York Thruway Connector was the last major piece of new construction and was dedicated in July 1957. Construction of the 163-mile “main stem” between Paramus and Cape May took only 30 months from planning through acquisition and construction. The final cost of the completed GSP (not including the 20 miles paid for by the Highway Department) was $330 million. NJHA Chief Engineer Harold Griffin and Design Engineer Oliver W. Deakin led a team of consultants including engineers, landscape architects, demolition contractors, bridge specialists, and paving contractors. Parsons, Brinkerhoff, Hall & McDonald, oversaw the entire project as the Consulting General Engineer with Clarke & Ramaupo and Coverdale & Colpitts serving as special consultants for landscape architecture and traffic engineering, respectively. The core design team was supported by a variety of local engineers working on specific sections of the GSP during various phases of design and construction. There were an equal number of construction contractors performing a variety of tasks including demolition, grading, paving, building construction, and installation of lighting, landscaping, and guiderails. Geo. M. Brewster & Sons, Incorporated and S.J. Groves & Sons Company were awarded many of the early grading, paving, and drainage contracts. Other contractors included Poirier & McLane Corp, Union Building & Construction Corporation, Franklin Contracting Company, and Gerber Wrecking & Supply Company. Bethlehem Steel won the $4.8 million contract to install the superstructure of the Raritan River Bridge in 1953. The Highway Authority relocated from Trenton to this historic farmouse near Red bank in 1954. The house served as the Authority headquarters until 1964 when a new facility was opened in Woodbridge. 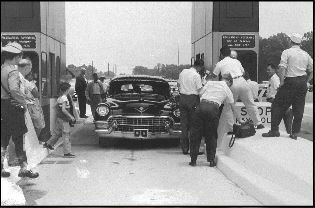 The first car passed through the Bergen Toll Plaza on July 1, 1955. 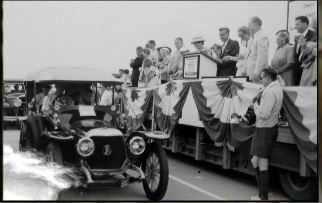 A parade of antique cars participated in the dedication ceremony for the Great Egg Harbor Bay Bridge in June 1956. November 8 - Gov. Walter Edge broke ground for the first section of the Route 4 Parkway at the Clark-Cranford-Winfield boundary. January - Alfred E. Driscoll, a Republican from Haddonfield, took office as the 43rd Governor of New Jersey. Driscoll served until 1953, and was largely responsible for enabling the construction of the Parkway. January 28 - Route 4 Parkway opened for travel between Route 27, Iselin and Central Avenue, Clark, in Union County. January 8 - Gov. Driscoll addresses the NJ Legislature and declared "There is an urgent need for additional parkways, freeways, and turnpikes to carry the commerce of our State and nation, to permit our citizens to travel more easily back and forth between their homes and businesses, for recreation, and, equally important, to achieve greater highway safety." April 14 - Gov. Driscoll signed the New Jersey Highway Authority Act, authorizing construction of the Garden State Parkway. July 2 - Gubenatorially appointed Commissioners Ransford J. Abbott, Bayard L. England, and Orrie de Nooyer took their oaths of office and held their first meeting. August 7 - Temporary loans of $17 million were obtained from 138 New Jersey banks for initial planning and construction costs. August 21 - The first two construction contracts were awarded by the NJHA. November 4 - New Jersey voters overwhelmingly approved a ballot referendum to allow the Highway Authority to finance construction with $285 million in State backed bonds paid for over 35 years. The vote count was 908,142 for; 505,181 against. February - NJHA awarded a contract to the Cleveland Wrecking Co. in the amount of $124,474 for the demolition of buildings within the GSP right-of-way. A total of $125,204,391.30 was awarded in 1953 for construction on all sections of the Parkway. May 25 - The New Jersey Supreme Court upheld a Superior Court ruling that the State guarantee of the bonds was constitutional. A taxpayer filed a lawsuit against the Highway Authority in December 1952 challenging the legality of the bond arrangement (Behnke v. New Jersey Highway Authority, 13 N.J. 14). July - A 4-mile stretch between Cranford and Route 22, Union, opened for travel. This was the last stretch of the GSP constructed using State Highway funds. January 12 - The first NJHA constructed section of the Parkway between the Union-Essex County line and Route 22 was opened for toll-free travel. 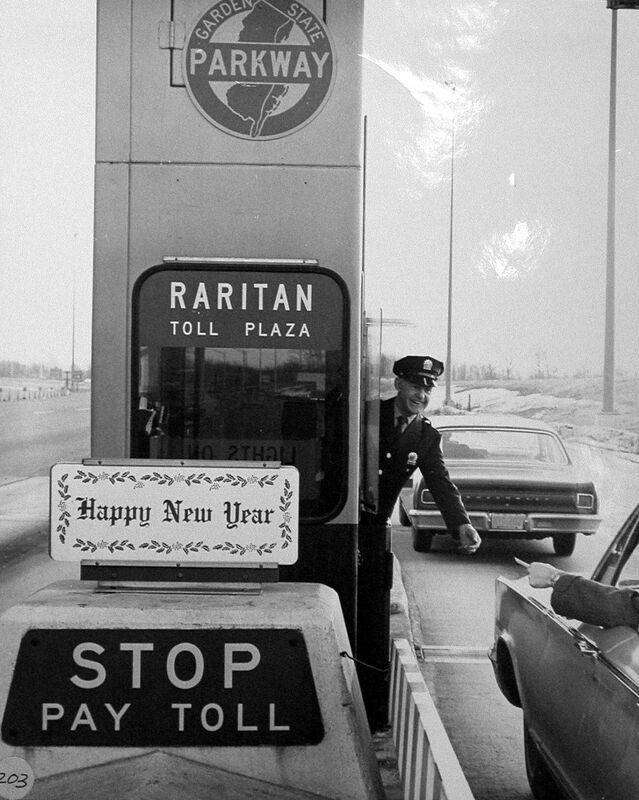 January 15 - George Vraken of Linden paid the first toll at 8:00AM at the Union toll plaza. July 15 - A 17-mile section between Toms River and Rt. 72 in Manahawkin opened for travel. August 4 - completion of several major construction projects allowed for uninterrupted north and south-bound travel for 80 miles between Irvington and Route 72, Manahawkin. The Raritan River (Driscoll) Bridge was also put into service. August 8 - The one-millionth toll paying vehicle passed through a toll plaza. 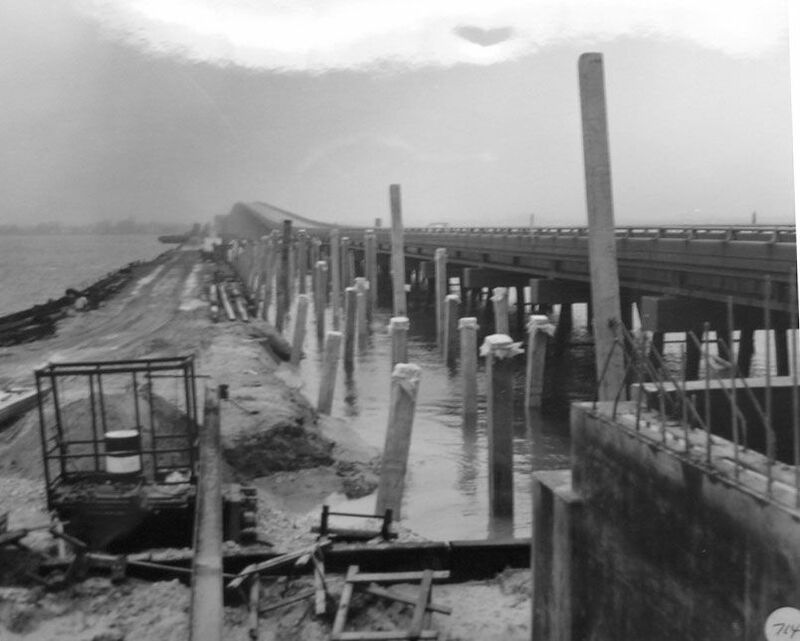 August 28 - Completion of the section between Manahawkin and Somers Point allowed for 113 miles of unbroken roadway. September 18 - The southern terminus of the GSP at Cape May was opened. October 23 - Grand Opening Celebration held at Telegraph Hill near Holmdel, Monmouth County. Governors Meyner and Driscoll presided over the ceremony, which was followed by a box lunch for more than 3,000 guests. 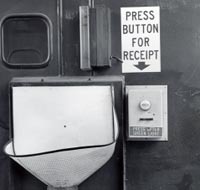 November 19 - First automatic toll collection equipment installed as a test at Union toll plaza. December 8 - The Parkway reached Newark, New Jersey’s largest city. May 12 - The Cheesequake Service Area, the first full service restaurant-gasoline rest area on the GSP, opened. October 28 - The northbound lanes around Cape May were opened for travel. April 16 - The Authority adopted the current logo as its official trailblazer. May 1 - Chairwoman Katharine White broke ground for the 9-mile New York Thruway connector between Paramus and the New York-New Jersey border. May 26 - The Great Egg Harbor Bay Bridge opened for travel. The bridge was the last major construction project along the main stem and fulfilled the Authority’s initial obligations to its bondholders. June 16 - Governor Meyner rode on the running board of a Stanley Steamer as it crossed the Great Egg Harbor Bay Bridge during the Dedication Ceremony. August 1 - Howard Johnson opened the restaurant at the Brookdale Southbound Service Area. November 1 - Walter Reade, Inc. assumed operations at the four southernmost Service Areas. July 3 - The New York Thruway Connector opened to traffic. The Thruway Connector was the last section of new construction on the GSP. 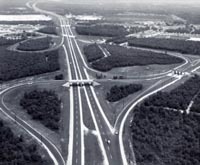 Several widening and interchange improvement projects were undertaken in 1958 and 1959. Similar projects have been planned and/or completed since the day the Parkway opened to traffic. The NJHA collected more than $70 million in toll revenue during its first five years of operation. The 1- day record was $108,640.77 collected on August 1, 1959. The plaza toll was $0.25 and the ramp toll was $0.10 during that time. The Great Egg Harbor Bay Bridge under construction in 1956. Thousands of acres needed to be cleared to make room for the GSP alignment. Construction of the Parkway was an enormous undertaking and utilized a massive amount of materials. The following statistics were report by the Highway Authority in 1959 after the final 153 miles were completed. To put them in perspective, we've included some modern references. Clearing-4,300 acres - Equal to 1/3 of Manhattan or 3251 football fields. Earth excavation-53,250,000 cubic yards - Could fill 94 Atlantic City Convention Halls. Surface pavement-7,7,00,000 square yards (bituminous) - Could pave ½ the City of Perth Amboy. Structural concrete-632,000 cubic yards (cement) - 614,000 cy of sand replenished on Brigantine Island in 2000. Drain pipe-1,260,000 lineal feet - Nearly twice the length of the entire Jersey Shore. Reinforcing steel-25,665 tons - More than 200 times the amount of steel in the Statue of Liberty. SOURCE: The First Five years 1959:5. If construction had continued at its pre-1952 pace and funding level, the Garden State Parkway would have been completed in 1992. All operational and maintenance expenses were paid for by toll revenues. 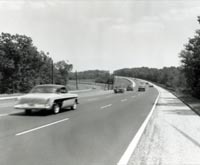 The State of New Jersey attempted to pay for construction of the Parkway through appropriations to the Department of Highways beginning in 1946. There was never enough money available to complete large sections of the road, and it was feared that the project would never be completed if it was entirely reliant on state funds. The New Jersey Highway Authority Act passed in 1952 allowed the Authority to float bonds to pay for road construction, with the projection that the Authority would support all of its operations and maintenance through toll revenue. Anxious to begin work, and confident that voters would approve the referendum, the Authority borrowed $17 million dollars from 138 New Jersey banks in Summer 1952 and began design and construction immediately. New Jersey voters approved a referendum on November 4, 1952 that allowed the Authority to float $285 million dollars in bonds with the backing of the State. 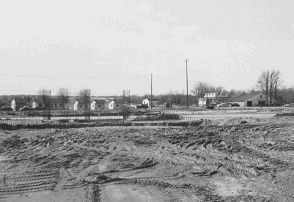 Construction and debt service costs rose steadily throughout the course of the project and floated an additional $20 million bond in 1954. A third bond in the amount of $15 million was offered on January 1, 1956. Toll revenue exceeded the projections offered by Coverdale & Colpitts within one year of the full Parkway's completion. 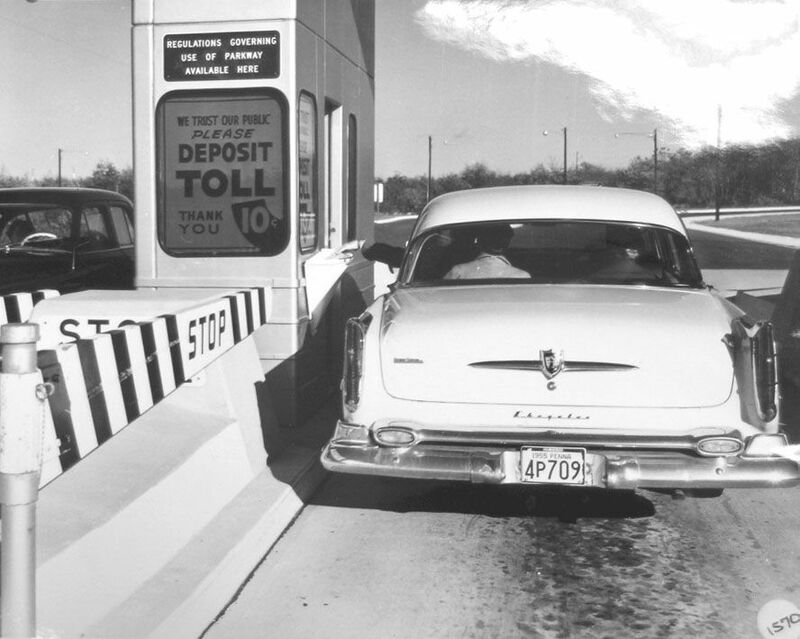 In 1959, toll revenues were 10% greater than projected and the reserves were invested to finance future operational expenses. 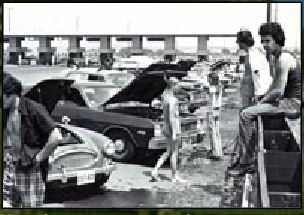 Motorists attempt to cool themselves and their cars near a toll plaza in 1971. The GSP was a busy thoroughfare from the day it opened. 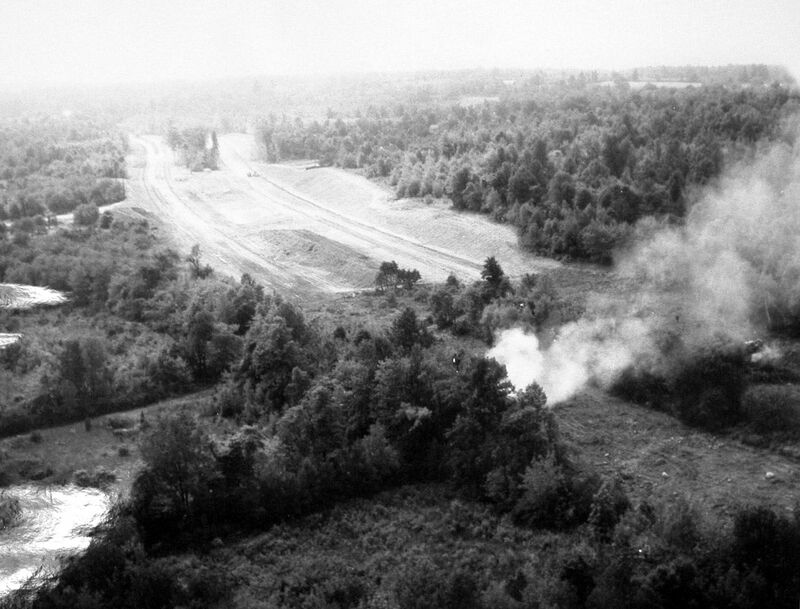 This scene is in Wall Township on the first day of the GSP’s operation in 1954. The NJHA published a series of maps highlighting a variety of recreational and historic attractions along the GSP that would be easily accessible to its motorists. The real benefit of the GSP was the time and money it saved drivers. The NJHA estimated that the average driver saved nearly 1.5 hours by driving the GSP instead of local roads on the 156-mile trip between Paterson and Cape May. Along the way motorists could enjoy a meal or service their vehicle at one of 8 rest areas, have a picnic lunch, or visit one of the many cultural attractions along the way. Commuters could purchase rolls of GSP token to make frequent trips easier. While tokens are still accepted at toll plazas, they are no longer sold and are being phased out. 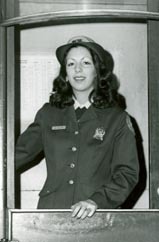 Donna Celfo was one of the first female toll collectors hired by the NJHA. Celfo and several other women began work in 1975. The Parkway, which opened to traffic in 1954, passes through 50 municipalities in 10 counties between the Cape May-Lewes Ferry in Cape May and the New York State line at Montvale. The highway is still at its original four lanes south of milepost 40 in Atlantic County and north of milepost 168 in Bergen County, but it has grown much wider in between. It’s now 12 lanes at its widest point in Monmouth and Middlesex counties. The highway is still at its original four lanes south of milepost 40 in Atlantic County and north of milepost 168 in Bergen County, but it has grown much wider in between. It’s now 12 lanes at its widest point in Monmouth and Middlesex counties. Walter Reade, Incorporated managed several rest area restaurants along the GSP, including "The Bibbery," a children’s diner at Forked River Rest Area in which adults could only be admitted when accompanied by a child. There were 8 full-service rest areas along the GSP, offering food, restrooms, and gasoline. Drivers on the GSP were well provided for, and had access to numerous rest areas, picnic groves, and gas stations along the 173-mile route. Full-service rest areas in the medians offered sit-down restaurants, fuel, pay telephones, and bathroom facilities. In addition there were 5 gas-only stations in the congested northern portion of the GSP. There were also 8 picnic areas between Middlesex and Cape May counties where motorists could enjoy a snack or a meal amongst the Pinelands of South Jersey. The fueling area at one of 8 full service rest areas along the GSP. A Texaco station along the northern section of the GSP. Esso gasoline was available at two of the Service Areas. Gasoline was available at all 8 full-service rest areas along the main stem and at 5 fuel-only facilities in Middlesex and Union counties. The rest area stations were owned by the NJHA and operated under contract by the fuel companies. Initially four brands of gasoline, Cities Service, Esso, Texaco, and Atlantic, were available. Cities Service operated four of the nine stations. The standalone facilities were privately owned and operated, and were constructed in pairs on opposite sides of the GSP. 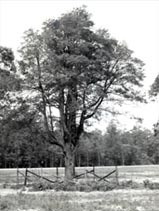 The 300-year old Shoemaker Holly near Cape May, celebrated as one of the oldest trees in New Jersey, was spared from demolition and became the centerpiece of the Shoemaker Holly Picnic Area. The GSP was at its root, a means to achieving an end. For millions of people of New Jerseyans and East Coast residents, it was the way to the Shore and the dozens of other recreational and historical attractions New Jersey had to offer. The GSP’s proximity to the coast made it the route of choice for people traveling southbound from the urban areas of New Brunswick, Newark, Union, and Manhattan to Atlantic City, the Wildwoods, and Cape May. The NJHA viewed the GSP not just as a road, but as a vital economic development tool and took every opportunity to promote the diverse places to go and things to do along the GSP’s 173-mile corridor. The Troop E Headquarters, New Jersey State Police in Holmdel, 1955. A telephone booth along the GSP, date and milepost unknown. 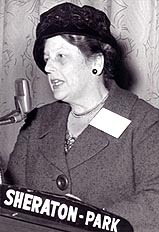 Katharine E. White, NJHA Chairwoman from 1955-1964, served as a member of the President’s Committee on Traffic Safety in 1962. Safety was one of the most important considerations in both the design and management of the GSP. The divergent roadways, tree-covered medians, and singing shoulders helped to keep drivers focused on the road and not become distracted by oncoming vehicles. The GSP boasted of its safety record and in 1963 the National Safety Council and the American Bridge, Tunnel, and Turnpike Association declared it to be the “safest superhighway in the nation.” The GSP averaged 0.7 fatalities per 100 million miles of travel in 1963. The national average for all roads that year was 5.4 and 2.4 for all turnpikes. The New Jersey State Police created a special unit, Troop E, to patrol the entire length of the GSP. 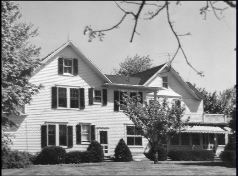 A new headquarters designed in the signature Colonial Revival style was built near Holmdel and served as the Troop’s base of operations. Telephone booths and emergency call boxes lined the GSP at regular intervals to allow motorists to contact the State Police or other emergency services if necessary. 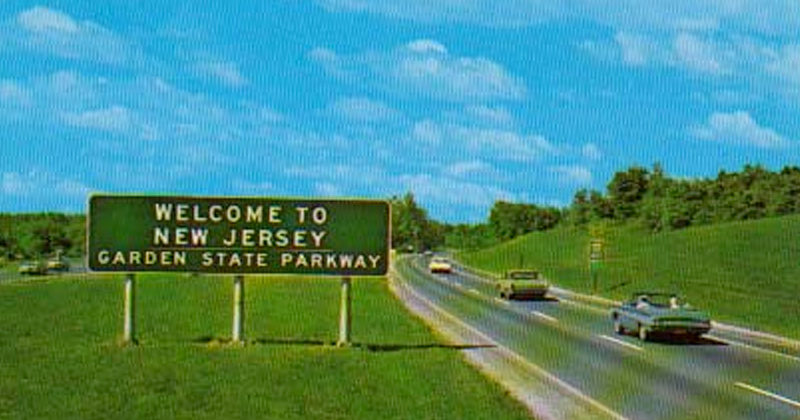 The Garden State Parkway was featured prominently in the New Jersey Pavilion at the 1964 World's Fair in New York. Miss Parkway Beauty Contest, c.1965. Exhibit touting the Garden State Parkway. Location and date unknown. The NJHA worked hard to convince New Jersey residents that their tax monies and tolls paid for the initial construction and maintenance of the GSP were both sound investments. The NJHA maintained an active public relations department that fielded inquiries, developed exhibits, and sponsored contests to promote the GSP to New Jerseyans and to the rest of the country. Exhibits espousing the benefits of the GSP and the opportunities it provided were set up at trade shows, rest areas, and visitors centers across the state. The GSP was featured prominently in the New Jersey Pavilion at the 1964 World’s Fair in New York. The Miss Parkway Contest ran for a number of years in the early 1960s, and dozens of young women competed for the right to wear the crown. What makes the Parkway special? What has the Parkway done for New Jersey? 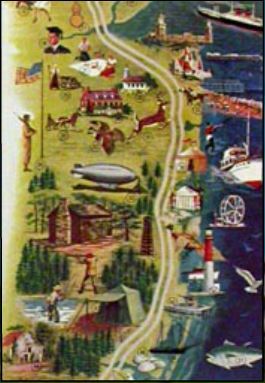 The NJHA produced modest maps such as this one in its annual reports to identify historic towns along the GSP‘s route. These maps were accompanied by text highlighting each town’s historic significance. View of the southern section, location and date unknown. The role that the GSP has played in the history of New Jersey is significant and immeasurable. It was at once, both an economic development tool and a wonder of modern design. The GSP has been recognized as a historically significant resource by the New Jersey Historic Preservation Office and is eligible for listing on the National Register of Historic Places. To celebrate the many births that occurred along the GSP, the NJHA established “The Stork Club” and hosted annual birthday parties for the children. In 1964, there were 23 members of the Club. The GSP incorporated many modern traffic control and safety features into a scenic, landscaped setting. With its emphasis on the natural landscape, the GSP distinguished itself from other expressways, such as the Pennsylvania Turnpike as shown above. 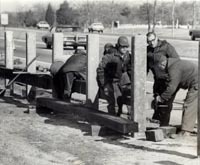 The physical elements that define the GSP and represent its historical significance include: bridges and culverts, retaining walls, grassy medians, controlled access with non-signalized interchanges, an absence of advertising, standardized signage, concrete and wooden guiderails, picnic areas, toll plazas and administration facilities, State Police barracks and maintenance areas, gentle grade, super-elevated horizontal curves, earthen berms, wide shoulders, limited curbing, its dull sage green color scheme, pullovers with telephone booths, acceleration lanes, and the incorporation of native vegetation. The GSP ushered in a new wave of development along the Jersey Shore, contributing to the growth of the tourism industry, residential development, and overall economic growth in this region. In fact, the GSP was seen as integral to the state’s economic growth in the wake of World War II, and was developed during a time when public funds were depleted from World War II and bond-financed toll roads were the fastest and easiest form of transportation projects. The GSP is also significant as an example of an innovative highway design that combines the bucolic attributes of earlier parkways, such as the Bronx River and Merritt parkways, with the speed and safety of a modern superhighway. By 1964, motorists had traveled more than 11 billion highway miles on the GSP, enough mileage to equal almost 50,000 trips to the moon. The GSP was promoted as a necessary route for advancing tourism, recreation, and quality of life. This collage was featured in the NJHA Annual Report in 1953. The NJHA anticipated that residential and commercial growth would be among some of the benefits accrued by the introduction of the GSP. The Garden State Parkway was planned to help generate economic activity and revitalize the state’s sagging tourism industry. Many of the Shore communities suffered through World War II, as men were shipped off to war and women ventured in the work force. Vacations were not part of the daily lives of most Americans. The decline in tourism dollars was noticeable and the shore communities suffered a particularly hard year in 1948. GSP supporters hoped to reverse that trend by making it faster, cheaper, and easier for people in northern New Jersey and New York to reach places like Atlantic City and Cape May. The GSP exceeded the expectations placed upon it by political leaders and the general public. The numerous interchanges were quickly surrounded by housing developments and shopping centers. In the first year alone, the ten counties that the GSP passed through gained $300 million in tax ratables, owing to new construction and resident and tourism dollars. In 1958, those same ten counties earned $269 million in ratables, four times the amount earned in New Jersey’s other eleven counties. These ratables were not just driven by tourism, though. Ocean County’s permanent population increased five-fold between 1950 and 1976. The New Jersey Turnpike Authority (NJTA) was created by an Act of the New Jersey State Legislature in 1948 for the purpose of constructing, maintaining, repairing, and operating the New Jersey Turnpike. In May 2003, the New Jersey Turnpike Authority Act was amended to consolidate the management and operation of both the New Jersey Turnpike and the Garden State Parkway under the control of the NJTA. This website was originally designed and developed by Atlantic City Electric, a subsidiary of Pepco Holdings, Inc., providing safe and reliable electric service to more than 500,000 customers in southern New Jersey. The website is now run by New Jersey Turnpike Authority. Most of the images that appear on this website are from the New Jersey Highway Authority Archives (now housed at the New Jersey Turnpike Authority (NJTA) Headquarters, Woodbridge, NJ) and are used with the permission of the NJTA, unless otherwise noted. The text of this website was written by Cory Kegerise and Gregory Dietrich of Cultural Resource Consulting Group (CRCG) in consultation with Atlantic City Electric, the New Jersey Historic Preservation Office, and the NJTA. ·Annual Reports of the New Jersey Highway Authority, 1952-1956. ·“The First Five Years of the Garden State Parkway.” New Jersey Highway Authority, 1959. ·“Autobiography of a Parkway”, New York Times Special Advertising Section, August 2, 1964. 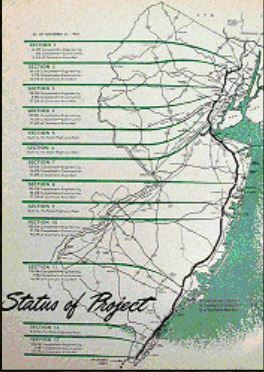 ·Various histories of the GSP developed by the New Jersey Highway Authority. ·Technical Memorandum No. 18 Cultural Resources Investigation Widening of the Garden State Parkway Interchange 30 to Interchange 80. Prepared by Richard Grubb & Associates for T&M Associates, 2000. ·Archaeological Survey for the Widening of the Garden State Parkway, Milepost 30 to Milepost 80, Atlantic, Burlington, and Ocean Counties, New Jersey. Prepared by Gannett Fleming, 2002. The content of this website has been reviewed and approved by the NJTA. The purpose of this site is to provide historical information relating to the development of the GSP and not to provide information about actual travel conditions, tolls, or other such information related to the GSP’s ongoing use. Dana Small and Robert Jubic, Pepco Holdings, Inc. Denise Rees, Shawn Taylor, Mary Kay Murphy, and Bruce Conner, NJTA Andrea Tingey, New Jersey Historic Preservation Office Caleb Kercheval and Mike Goodsell, Hamptons Online.